Hi. Are you sure a 15" laptop will fit? I'm trying to find out if a 15" Macbook Pro will fit. 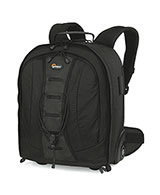 The lowepro site says it's only for 12" laptops. I just got this netbook yesterday, after ordering it on Tuesday (ground UPS shipping was lightning fast). Not only is this my first netbook, it's my first laptop. I am completely delighted with it so far! Easy set up, great WiFi connection, larger, longer lasting battery. I would certainly recommend this netbook to anyone looking for a second, portable computer. I am not finding the trackpad buttons too difficult to operate and the keyboard is lively and responsive. Hi I came across this website by mistake, I was flipping through Google for consumer goods reviews when I came upon your site, I must say your website is really great I truely think the content, its amazing! I'm strapped for time in this instance to totally read through your site but I have saved the location of it and also signed up for your RSS feeds. I will be back when I have more time. Thank you for a great webpage.